At least once a week, I hear Byron softly moan consciously or in his sleep “Pitfire Burrata Pie” referencing his fav cheat meal at our neighborhood artisanal pizza shop. 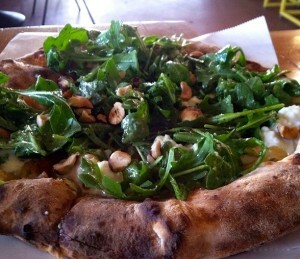 Light airy crust, creamy burrata cheese, sweet tomato sauce + caramelized onion, crunchy hazelnuts, fresh peppery arugula + salty herbaceous pesto… Pitfire Pizza has really struck a perfect balance using these classic Italian combinations. It’s delicious! I’m not surprised Byron dreams about it! Being lactose + gluten-intolerant, conventional pizza is pretty much my kryptonite. Sure, I love to dance with the devil + try my luck. I can have a bite or two + even furtively slide the toppings off a slice into my Kale Salad with Roasted Chicken, which with pickled golden raisins, parmesan toasted almond, red onion + mint is arguably very tasty, but impossible to solely focus on when in a room saturated with the intoxicating aroma of freshly baked dough + marinara + stuffed with drooling pizza fiends snarfing down Italy’s single best contribution to the planet. No, their gluten free crust ain’t the same. They buy the same dense compressed premade frozen crust as every other restaurant nice enough to provide it. It still settles into an indigestible brick in my belly, taunting me with a bloated poo belly for the next 48 hrs. What’s stopping you from whipping up fresh gluten free dough? I smell a major opportunity to differentiate one’s pizza parlor from competitors here in Los Angeles, the epicenter of food intolerances, allergies + competitively extreme diets. If I can make it, so can you! It’s not just me who has a problem with pizza. Sure, we workout + thus, have the metabolism to assassinate many hundred more calories each day than comparably sized inactives, as well as those cheat meals here + there, but let’s face it, Byron cannot simply eat whatever he wants 24/7 either. You’ve seen what happened on the Pity Me Program: BYRON BEFORE + AFTER. 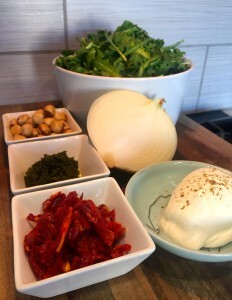 So, I wanted to extract the delicious flavors of Pitfire’s Burrata Pie to enjoy a decent portion without killing myself + prevent Byron from reverting back to bad habits. Choosing all organic, GMO-free ingredients tastes great. We upped the green content to provide 2 entree sized salads using a full 7 oz bag of organic arugula. Without crust, topping salad with Marinara Sauce would yield a stewy mess. Instead choose sun-dried tomatoes. The gentle heat that ellicits their sweet tang but zaps moisture content makes them a perfect salad topper. A light rehydration with hot water also increases volume, meaning you can use fewer further reducing calories, without sacrificing satisfying texture or flavor. Instead of caramelizing onion slices with loads of butter + salt, we used about 1/3 Tbsp olive oil. That heat still extracts the natural sweetness! Roasted hazelnuts are exquisite already. Why dirty them with tummy-bloating salt? Obviously, a pizza needs cheese. Reducing the amount of cheese by used in our salad by about 75% is a big start. Going organic is also a big help. Those with extreme lactose intolerance can still choose to skip cheese in recipe or try my fav nearly lactose-free Israeli sheep milk feta sold under name Pastures of Eden @Trader Joe’s or Tnuva @ Costco. Using our already low fat + low sodium Pistachio Pesto vs regular pesto, yes, Smartypants, cuts massive fat, sodium + calories. 856 calories, 52g fat, 73g carbs + between 1900 + 2700mg sodium!!! To caramelize onions, raise saucepan to medium-high heat then add a tiny splash of your olive oil about 1/3 Tbsp. Tilt to coat pan, then add sliced onion + few cranks of fresh ground pepper. Toss onions in olive oil with spatula for 2-3 minutes to soften. Add white balsamic vinegar + water, tossing again to distribute. Reduce heat to low-medium to simmer while you prep rest of salad. Keep an eye on onions, stirring every few minutes to avoid sticking to pan. Add more water if needed. The longer they cook the more soft and sweet they will become! 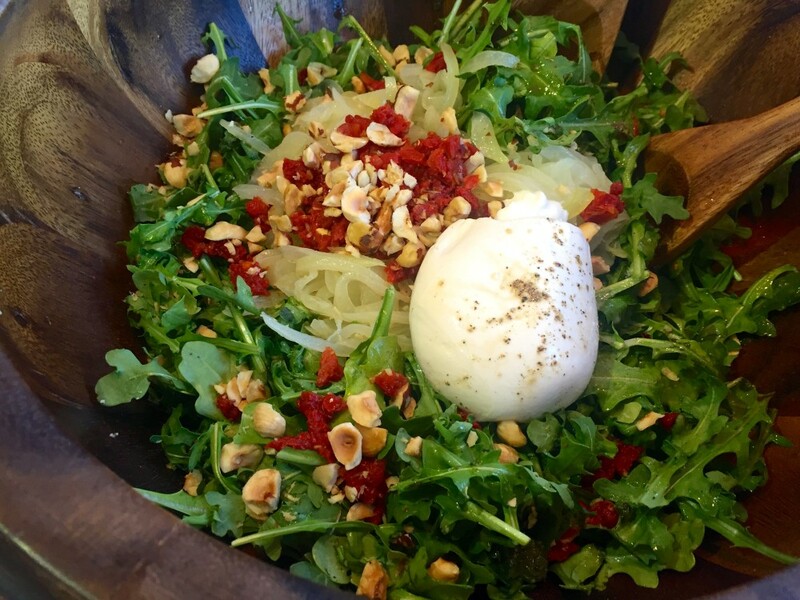 Place arugula in large salad bowl. Stir remaining olive oil into Pistachio Pesto, then add to salad bowl and toss. On cutting board, finely dice sundried tomatoes, place in tiny dish + about 2 Tbsp boiling water. Stir, then cover with a plate + set aside to allow tomatoes to absorb water, soften + puff up a bit. Place hazelnuts on cutting board, then use a flat-bottomed plate or dish press firmly down on nuts to crush a bit. Add to salad bowl. Add burrata and gently use fingers to pull apart into pieces. Check to see that onions have softened to your liking and have absorbed most of liquid in pan. Add hot onions + sundried tomatoes to salad bowl. Toss to lightly wilt salad. Serves 2. Protein Pairings? With cheese + hazelnuts, it’s a more rich salad, so enjoy your indulgence + pair with a lighter protein. Great with a thick steak-like white fish, such as halibut or sea bass, as well as the grilled chicken breast I know you’ve been dutifully prepping at the beginning of the week. Vegetarians can add 1 1/2 – 2 cups garbanzo beans to 2 serving salad. Byron always adds Pitfire’s Fennel Sausage to this pie. 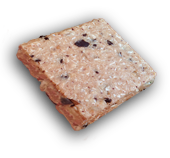 It’s really yummy, but again like most restaurant-fare, not organic and loaded with sodium. I can recommend an organic sausage, Silva Sausage at Costco, but unfortunately, no one is making low-sodium sausage, so I usually opt for a different protein. More Moisture? Add additional white balsamic vinegar or a squeeze of fresh lemon juice. More Greens? Chop as much additional spinach as you like and toss. More Fiber? If you dig fennel, slice it as thinly as possible using manmodolin or knife. Keep it raw or cook with onions to bring out fennel’s natural sweetness.